The kitchen pantry in my house is a misnomer. It a small kitchen closet, 25 ¼ inches wide by 27 ½ deep, extending all the way up to the ceiling-level. The builders installed shelves roughly fifteen inches apart. When I first moved in, I attached a pair of narrow wire shelf units to the inside of the door, seven shelves, each one just deep enough to hold a single can, small box or bottle. Later, I put in three wire shelves above the existing shelves. These needed a step-ladder to access. I put the little-used items on them ... and then pretty much dropped doing anything more, except for when it was necessary to go spelunking to the back of the deep shelves looking for a box of lasagna noodles. A couple of years ago, my daughter put various appliances that we didn't keep on the countertop, and a collection of French porcelain cooking dishes into the pantry, and put the foodstuffs into the little butcher-block topped kitchen island. Not much better; we still had crammed and disorganized shelves. 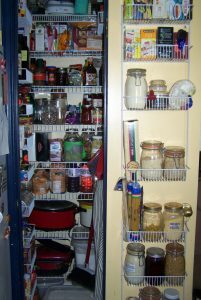 We had often discussed the means of making the pantry more usable, but hesitated because of the hassle. We reached Peak Exasperation this week; when the chore of doing something overcomes the continued hassle of existing with it. I told my daughter to get some boxes from the garage, and empty out of the lower shelves, then get a hammer and knock out the shelves and their supports. Done and done – and then off to Lowe's for certain necessary materials, including a patching kit to repair dings in the wall, and a sample pot of paint to cover over the places where the shelves had come away. My daughter originally didn't want to take the trouble. She wanted it done all in a day – but I wanted to go a thorough job, and knew that it would look awful if we didn't. Lengths of wire shelving and the clips and brackets to attach them didn't cost that much. Eight sets of narrow two-shelf units to go along the sides were a little pricy, but the small dimensions of the pantry meant that nothing standard would fit, being either too large or two small. I had them cut seven 25-inch lengths, and we loaded it all in the car and went home. It took a few hours to patch and paint the walls, which interested the cats very much. When the paint was dry, I went to work with a pencil and a carpenter's level. My daughter had wanted to do adjustable shelves on tracks attached to the back wall, but I vetoed that as being just too expensive. Besides, I had no clear idea of where the studs were in the walls and no interest in searching. I measured the various containers and appliances that we would store on the shelves and tailored the spacing to suit; two shelves 12 inches apart, two at 10 inches, and the rest at 9. I drew a level line across the back wall and out the sides to exactly 12 inches, and went to work with a power drill set with a ¼ inch bit. This took the rest of the day, drilling the holes, and pounding in the clips to support the shelves. The next day, we made a trip to the Container Store for ... well, containers, especially four plastic tubs with airtight tops to store bulk staples in. Those I intended to go on the lower shelves. I had an eye on a short rack to hold mops and brooms, and another wire rack to hold upright boxes and rolls of tinfoil, wax paper and rolls of vacuum-seal bags. That last we had to go back to Lowe's for. Instead of four narrow shelves on each side, I put five on one side, two on the other, with the mop holder and the roll rack underneath them. Wonder of wonders, we can now close the pantry door. And it all looks ... very much more organized. No need to hunt for lasagna noodles, or anything else now – it's all right there.